• After everyone has entered the vehicle, be sure all doors are closed and locked. • Adjust your seat to a position suitable for driving. Be sure the front seats are adjusted as far to the rear as possible while allowing the driver to control the vehicle. Sitting too close to a front airbag can result in serious or fatal injury in a crash. • Adjust head restraints to the proper position. 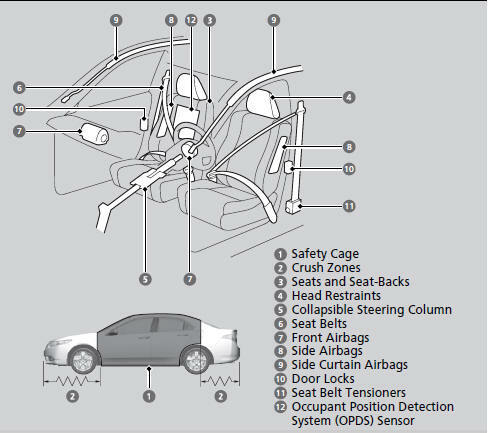 Head restraints are most effective when the center of the head restraint aligns with the center of your head. Taller persons should adjust their head restraint to the highest position. • Always wear your seat belt, and make sure you wear it properly. Confirm that any passengers are properly belted as well. • Protect children by using seat belts or child seats according to a child’s age, height and weight. 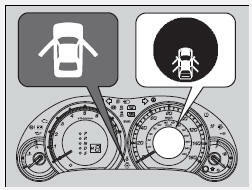 If the door and trunk open indicator is on, a door and/or the trunk is not completely closed. Close all doors and the trunk tightly until the indicator goes off.